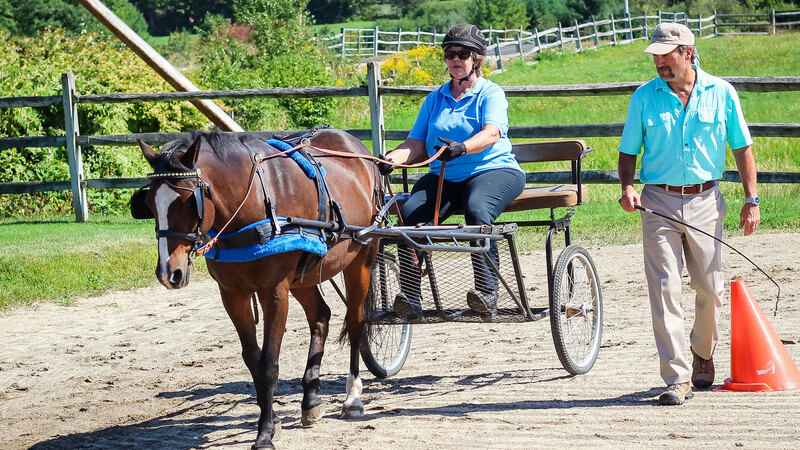 Sports Programs are open to any able-bodied rider/driver and rider/drivers with disabilities seeking a competitive and/or independent sports track is eligible to apply for enrollment. Generally speaking, riders begin traditional lessons no younger than age 5. Team participation is restricted to riders who do not exceed 190 pounds, who are able to adhere to safety standards, follow directions, manage basic patterns, show good body control and balance, and be free of sidewalking support. Horse handling support is available for less independent riders. See the current calendar for specific dates. There are steps that students must meet before we can enroll them in our program. The first step is to contact the office to discuss space availability and program suitability (207-985-0374, info@carlisleacademymaine.com). We will determine eligibility and assists the necessary paperwork including insurance benefits and other funding resources as needed, including scholarships through our charitable partner, the Carlisle Charitable Foundation. An intake and evaluation meeting will be scheduled with the appropriate Carlisle staff to find an appropriate program type. Once the necessary paperwork is completed, the student is enrolled in an upcoming session or placed on a waiting list, either on a per diem basis or for a complete session. No student may begin a session until the necessary forms are received. Enrollment midway through a session is considered on a case-by-case basis. Please, read the following information carefully, and contact our office if you have any questions. We believe that integration of therapy and sports programs promotes social inclusion, family cohesion, community building, and richness in learning.